Previous data have strongly implicated hindbrain catecholamine/neuropeptide Y (NPY) coexpressing neurons as key mediators of the glucoprivic feeding response. Catecholamine/NPY cell bodies are concentrated in the A1 and caudal C1 cell cluster (A1/C1) in the ventrolateral medulla, a region highly sensitive to glucoprivic challenge. To further investigate the importance of this catecholamine subpopulation in glucoregulation, we used small interfering RNA (siRNA) technology to produce a targeted gene knockdown of NPY and dopamine-β-hydroxylase (DBH), a catecholamine biosynthetic enzyme. Unilateral injection of NPY siRNA and DBH siRNA (0.02 nmol each) both significantly inhibited expression of the targeted genes up to 2 d, as revealed by real-time PCR, and reduced protein expression up to 8 d, as revealed by immunohistochemistry, compared with the control nontargeting siRNA (ntRNA) side. Subsequently, targeted siRNA or control ntRNA was injected bilaterally into A1/C1 and responses to 2-deoxy-d-glucose (2DG; 200 mg/kg)-induced glucoprivation were tested 3–7 d later. Silencing of either Npy or Dbh alone did not reduce glucoprivic feeding or hyperglycemic responses, compared with responses of ntRNA-injected controls. In contrast, simultaneous silencing of both Npy and Dbh reduced 2DG-induced feeding by 61%. Neither the hyperglycemic response to 2DG nor feeding elicited by mercaptoacetate (68 mg/kg)-induced blockade of fatty acid oxidation (“lipoprivic feeding”) was reduced by simultaneous silencing of these two genes. These results suggest that catecholamines and NPY act conjointly to control glucoprivic feeding and that the crucial NPY/catecholamine coexpressing neurons are concentrated in the A1/C1 cell group. Glucose is an obligate metabolic fuel for the brain, necessary for both normal function and survival. Protection of the brain's glucose supply depends on a number of glucoregulatory responses, elicited by glucose deficit, that function to conserve and redistribute remaining glucose stores and restore circulating glucose levels. Studies using the selective catecholamine immunotoxin, anti-dopamine-β-hydroxylase (DBH)-saporin, have demonstrated that key glucoregulatory responses, including feeding (Ritter et al., 2001), adrenal medullary secretion (Ritter et al., 2001; Madden et al., 2006), corticosterone secretion (Ritter et al., 2003) and suppression of estrous cycles (I'Anson et al., 2003), require hindbrain epinephrine (Epi) and/or norepinephrine (NE) neurons. In addition to glucoregulatory responses, other critical homeostatic functions are also controlled by hindbrain catecholamine neurons (Gieroba et al., 1994; Stornetta et al., 1999; Madden and Sved, 2003; Rinaman, 2003; Date et al., 2006; Dinh et al., 2006; Pertovaara, 2006). The functional heterogeneity of these neurons and the anatomical complexity of the hindbrain have made it difficult to identify the specific catecholamine neurons associated with particular functions. Here we use RNA-mediated interference to localize and establish the phenotype of catecholamine neurons involved in glucoprivic feeding. RNA-mediated interference is a sequence-specific RNA silencing mechanism (Sioud, 2004; Dillon et al., 2005) triggered in mammalian cells by the presence of double-stranded RNA or small interfering RNA (siRNA) (Fire et al., 1998; Elbashir et al., 2001). Binding of active siRNA to the target mRNA leads to cleavage and degradation of the target mRNA, resulting in a reversible silencing of gene expression (“gene silencing”). siRNAs are potentially powerful tools for defining the specific functions of particular neuronal phenotypes, even when these phenotypes are intermingled with cells of other phenotypes and functions. Here we apply gene silencing to NE and Epi neurons in the area of overlap of cell groups A1 and C1 (A1/C1) to determine their importance for glucoprivic feeding. Previous work strongly suggests that this group is important for the feeding response. Nearly all A1/C1 neurons coexpress neuropeptide Y (NPY) (Everitt et al., 1984; Sawchenko et al., 1985) and either NE or Epi, all of which are orexigenic when administered centrally (Ritter et al., 1975; Stanley and Leibowitz, 1984, 1985; Leibowitz et al., 1988; Taylor et al., 2007). The A1/C1 neurons are potently activated by glucoprivation (Ritter et al., 1998; Li and Ritter, 2004; Li et al., 2006), they innervate hypothalamic areas known to be critical for metabolic and appetite controls (Sawchenko et al., 1985), and are destroyed by injections of anti-DBH-saporin that abolish glucoprivic feeding (Ritter et al., 2001). Nevertheless, some catecholamine neurons located in other cell groups share some of these properties. Therefore, to determine the importance of cells in A1/C1, we focused our gene silencing on this site, targeting the genes for Dbh and Npy. We hypothesized that if A1/C1 neurons mediate glucoprivic feeding, localized silencing of Npy and/or Dbh expression in this site would impair this response. We also examined effects of this treatment on lipoprivic feeding, a response that does not require these catecholamine neurons (Ritter et al., 2001). Male Sprague Dawley rats were purchased from Simonsen Laboratories and housed individually in an animal care facility approved by the Association for Assessment and Accreditation of Laboratory Animal Care. Rats were maintained on a 12 h light/dark cycle with ad libitum access to pelleted rodent food (F6 Rodent diet; Harlan Teklad) and tap water. All experimental procedures were approved by Washington State University Institutional Animal Care and Use Committee, which conforms to National Institutes of Health Guidelines. Catecholamine cell groups are defined as in Paxinos and Watson (1997). However, we have adopted additional terms to subdivide cell group C1 along its rostral-caudal extent. The caudal portion of C1 overlaps cell group A1 and, as in the atlas, is designated as A1/C1. We refer here to the middle portion of C1 as C1m, which extends from 12.72–12.30 mm caudal to bregma. The rostral portion (C1r) extends rostrally another 0.5 mm to the caudal border of the facial nucleus (12.30–11.70 mm caudal to bregma). For siRNA injections, rats were anesthetized using 1.0 ml/kg body weight of ketamine/xylazine/acepromazine mixture [5 ml of ketamine HCl, 100 mg/ml (Fort Dodge Animal Health); 2.5 ml of xylazine, 20 mg/ml (Vedco); 1 ml of acepromazine, 10 mg/ml (Vedco); and 1.5 ml of 0.9% saline solution] and placed in a stereotaxic device. Rat NPY siRNA (L090209), DBH siRNA (L090166), and control nontargeting siRNA (ntRNA; D001810) were purchased from Dharmacon. Each targeted siRNA was a mixture of 4 siRNAs formulated to enhance the effectiveness of the mixture in knockdown the target gene. The control ntRNA was mixture of siRNAs with scrambled sequences, confirmed by microarray to have minimal targeting of known genes in human, mouse, and rat cells. siRNAs were dissolved in distilled water (pH = 7.4). Unilateral or bilateral injections (200 nl/site) were delivered slowly over a 5 min period into the target hindbrain region through a pulled glass capillary pipette (30 μm external tip diameter) using a Picospritzer (Parker). For A1/C1 injection, the capillary pipette was positioned just dorsal to the targeted site at the occipital suture ± 4.0 mm lateral to midline and 8.6 mm ventral to the skull surface, using an angled (15°) approach (Paxinos and Watson, 1997). For determining the regional specificity of the gene silencing, one group of rats was injected with siRNA mixture outside the targeted A1/C1 site (i.e., 8.0 mm ventral to skull surface). The dose of siRNAs (0.02 nmol) was determined from previous report (Chen et al., 2006) and our preliminary experiments (see Results for details). Feeding and blood glucose tests. For glucoprivic feeding tests, rats were injected subcutaneously with 2DG (200 mg/kg body weight in 0.9% sterile saline; Sigma-Aldrich) or with 0.9% sterile saline vehicle as control. Then food intake was measured during the subsequent 4 h. Hyperglycemic responses to glucoprivation were measured in separate tests in the absence of food. Glucose was measured using a FreeStyle glucose monitor (Abbott Diabetes Care) from tail blood collected 15 min before and 90 min after a subcutaneous 2DG (200 mg/kg) injection. Previous studies have shown that the hyperglycemic response peaks at this time point after 2DG injection (Ritter et al., 2001, 2003). Blood glucose tests were conducted in the absence of food, which was removed 2 h before the start of the test. For lipoprivic feeding tests, rats were injected with β-mercaptoacetate (MA), which inhibits mitochondrial β-oxidation of fatty acids (Bauché et al., 1981, 1983) and stimulates food intake over a time course similar to glucoprivation (Scharrer and Langhans, 1986; Ritter and Taylor, 1989). For this test, MA (68 mg/kg body weight in 0.9% sterile saline; Sigma-Aldrich) or 0.9% sterile saline (control) were injected intraperitoneally and intake of the standard pelleted maintenance diet was measured during the subsequent 4 h period, as described in our previous work (Ritter et al., 2001; Bugarith et al., 2005). All feeding and blood glucose measurements were performed between 3 and 7 d after siRNA injection, when suppression of gene expression was maximal (see Results for details). Each rat was tested in one or two of the three 2DG tests (saline-induced feeding, 2DG-induced feeding, or 2DG-induced hyperglycemia), or in both MA tests (saline-induced feeding and MA-induced feeding) during this period. Tests were separated by at least 2 d.
To confirm siRNA silencing of targeted gene expression, the protein product of the gene was detected using immunohistochemistry (IHC). On the day after the last behavioral test, rats were killed by deep anesthesia with halothane (Halocarbon Laboratories). Just before cessation of the heartbeat, rats were perfused transcardially with cold PBS, pH 7.4, followed by freshly made cold 4% formaldehyde in PBS. After perfusion, brains were rapidly removed and placed in 4% formaldehyde/PBS at 4°C for overnight, then transferred to 12.5% and 25% sucrose in PBS for 24 h each. The hindbrains were sectioned coronally on a cryostat at 40 μm thickness and collected into four serial sets for IHC. IHC staining was performed using standard avidin-biotin-peroxidase techniques as described previously (Bugarith et al., 2005; Li et al., 2006). Briefly, sections were treated with 50% ethanol for 25 min. After incubation in 10% normal horse serum (NHS) in PBS for 30 min, the sections were incubated for 3 d in mouse monoclonal anti-DBH (1:40,000; Millipore) or rabbit anti-tyrosine hydroxylase (TH) (1:6000; Millipore) in 10% NHS/PBS at 4°C, or rabbit anti-NPY (1:4000; ImmunoStar) at room temperature for 1 d. After washing with PBS, sections were incubated in biotinylated donkey anti-mouse or anti-rabbit IgG (1:500; Jackson ImmunoResearch Laboratories) made in 1% NHS for overnight (16–17 h). After incubation with ExtrAvidin-Peroxidase (1:1500; Sigma-Aldrich) for 4 h, sections were washed and reacted for visualization of the immunoreactivity using diaminobenzidine or nickel-intensified diaminobenzidine in a peroxidase reaction to produce a brown or gray/black reaction product, respectively. To examine effects of NPY gene silencing on NPY peptide expression, rats were anesthetized using 1.0 ml/kg body weight of ketamine/xylazine/acepromazine mixture. A lateral ventricle cannula was implanted (1.0 mm rostral to bregma, 1.5 mm lateral to midline, and 3.9 mm ventral to brain surface (Paxinos and Watson, 1997) for later injection of colchicine. Then NPY siRNA (0.02 nmol) was injected unilaterally into A1/C1, and ntRNA was injected into the contralateral A1/C1. One day before they were killed, rats were injected with colchicine (90 μg in 9 μl of saline; Sigma-Aldrich) into the lateral ventricle. To assess the efficacy, selectivity and area of gene silencing, cell bodies expressing the protein product of the targeted genes (i.e., Dbh and Npy) were quantified. In addition, cell bodies expressing TH were quantified in the same areas. TH is a biosynthetic enzyme upstream of DBH, which is involved in the synthesis of all catecholamines. Hence, TH can be used as a marker for DBH-expressing neurons that can be detected even when DBH protein expression is suppressed. Furthermore, Th can be used in PCR or IHC studies to normalize Npy and Dbh expression levels. For each rat, DBH-, NPY- and TH-expressing cell bodies were counted bilaterally in three consecutive coronal sections (from one of four parallel sets of sections) at each of the following anatomical levels (distance in mm) (Paxinos and Watson, 1997): A1 at 14.5–14.1; A1/C1 at 13.5–13.1; C1m at 12.6–12.2; and C2 at 12.8–12.4. Thus, we quantified cells in the targeted site (A1/C1) and in areas of the ventrolateral medulla (VLM) immediately caudal to (A1) and immediately rostral to (C1m) the targeted site. Intensity of DBH and NPY protein expression in detectable A1/C1 cells was also analyzed after unilateral injection of siRNA or ntRNA. Intensity was measured in optical density using Image-Pro Plus software (Media Cybernetics). The intensity of DBH or NPY immunoreactivity in soma of individual cells (after subtraction of background) and the size (area) of soma of detectable cells in A1/C1 were compared between ntRNA- and siRNA-injected sides. Real-time PCR was used to measure the changes of mRNA levels in dissected VLM tissues after NPY siRNA (0.02 nmol) or DBH siRNA (0.02 nmol) injection into A1/C1. Rats, 24, 48 or 72 h after siRNA injection into one side of A1/C1 area (the other side was injected with control nontargeting siRNA), were anesthetized deeply with halothane (Halocarbon Laboratories), and were quickly decapitated. The brain was removed and frozen on dry ice. A 2.0-mm-thick coronal slice was cut using obex (defined here as the caudal border of the area postrema) to locate the caudal border of the slice (0–2.0-mm-rostral to obex). Desired regions of the VLM, including A1/C1, were punched from the slice with a needle having a 1 mm inner diameter. Punched samples were quickly placed into TRIzol (Invitrogen) for total RNA isolation. DNase I-treated total RNA (0.3 μg) was reverse transcribed with oligo(dT)20 primer using Superscript III (Invitrogen) for first-strand cDNA synthesis. PCR Primers were designed using Primer3 software (http://fokker.wi.mit.edu/primer3/input.htm), and if possible an intron was spanned. Standard curve and efficiency analysis of each primer pairs were performed with a primers efficiency >90%. The sequences of primers used are: for rat Npy, 5′-aga gat cca gcc ctg aga ca-3′ and 5′-ttt cat ttc cca tca cca ca-3′; for rat Th, 5′-aca cag cgg aag aga ttg ct-3′, and 5′-gga tgc tgt cct ctc ggt ag-3′. The real-time PCR was performed in triplicate using the Platinum Quantitative PCR SuperMix-UDG (Invitrogen) with 4 μl of diluted cDNA (1:3 with water) in a final reaction volume of 25 μl. The amplification was followed by 40 cycles of denaturation at 94°C for 15 s, annealing at 58°C for 15 s and extension at 72°C for 15 s. Finally, a melting curve was generated by stepwise increases in temperature (0.5°C increase every 10 s) for 80 cycles starting at 56°C. The threshold cycle (Ct) was determined using SYBR Green fluorescence with iCycler iQ software (Bio-Rad Laboratories). Gene expression was evaluated by means of a comparative Ct method and normalized to Th expression. Because of very low expression levels of DBH mRNA in the dissected tissue, we could not get reliable data for DBH mRNA levels in the present study. The dissociation curves of each primer pair used in this study showed a single peak and the samples tested after the PCRs had a single expected DNA band on agarose gels. All results are presented as mean ± SEM. For statistical analysis of data, we used a paired or unpaired t test or one-way ANOVA. After significance was determined using one-way ANOVA, multiple comparisons between individual groups were tested using a post hoc Bonferroni t test. p < 0.05 was considered to be statistically significant. Preliminary studies to assess the effectiveness of siRNAs on silencing of targeted gene expression showed that 2–3 d after the injection of 0.01–0.02 nmol of siRNA into the C2 cell group, the number of DBH-positive neurons in the DBH siRNA injection side was only 46.8% of the number present on the contralateral control side injected with ntRNA (11.0 ± 0.9 vs 23.5 ± 1.0; p < 0.0001). A higher dose (0.04 nmol) produced no greater effect. Therefore, 0.02 nmol was used in the all subsequent studies. Results showing the time course of siRNAs on Npy expression, analyzed with real time PCR and normalized to TH mRNA, are shown in Table 1. NPY mRNA levels in VLM tissue samples containing the A1/C1 injection site were significantly reduced on the side injected with NPY siRNA, compared with the side injected with ntRNA control. NPY mRNA levels were reduced 1 and 2 d, but not 3 d, after injection. PCR results were not reliable for DBH mRNA because of the very low levels of gene expression in the homogenized hindbrain tissue. The effect of siRNAs on the protein products of the targeted genes, as detected using IHC, is shown in Figure 1 and Tables 2 and 3. Three days after injection into A1/C1, the number of DBH-positive cells in A1/C1 on the side injected with DBH siRNA was only 42.7% of the number present on the side injected with ntRNA. The effect of DBH siRNA on DBH protein was still present 8 d after the injection, but showed some recovery (57.0% of the control side). The inhibition of DBH expression was limited to the A1/C1 region, as numbers of DBH-positive cells in DBH siRNA- and control ntRNA-injected sides were similar in A1 and C1m areas bordering the A1/C1 injection site (Table 2). As shown in Table 3 and Figure 1, NPY siRNA injected into A1/C1 in colchicine-treated rats inhibited NPY expression in A1/C1 3–4 d, and 7–8 d after the injection, compared with the contralateral A1/C1, injected with ntRNA. NPY siRNA-induced inhibition of NPY expression was limited to the A1/C1 region. In the A1 and C1m regions bordering A1/C1, the numbers of NPY-positive cells did not differ between the NPY siRNA and control-injected sides (Table 3). Not only was there a reduction in the number of immunoreactive cells that were visible after siRNA injection, but the intensity of DBH and NPY immunoreactivity in the visible cells was also decreased by siRNA injection into A1/C1. Quantitative data showed that 3 d after the injection the mean optical density of DBH expression in A1/C1 soma on the DBH siRNA-injected side was 4412.9 ± 188.5 (mean of 123 neurons), compared with 6220.1 ± 247.9 (mean of 146 neurons) on the ntRNA-injected side (a 29.1% decrease from the ntRNA side; p < 0.001), whereas the size (area) of soma was similar between them (51.8 ± 1.3 μm2 on the DBH siRNA-injected side vs 51.0 ± 1.6 μm2 on the ntRNA-injected side; p > 0.7). NPY intensity in soma showed a similar decrease (32.2%) at 3–4 d after NPY siRNA injection; i.e., from 2903.5 ± 90.5 on the ntRNA side (n = 85 neurons) to 1967.8 ± 119.2 on the NPY siRNA side (n = 48 neurons; p < 0.001). Again, the mean size (area) of the visible immunoreactive soma was not altered by the injection (47.2 ± 1.3 μm2 for the ntRNA side and 50.6 ± 1.7 μm2 for the NPY siRNA side, p > 0.1). 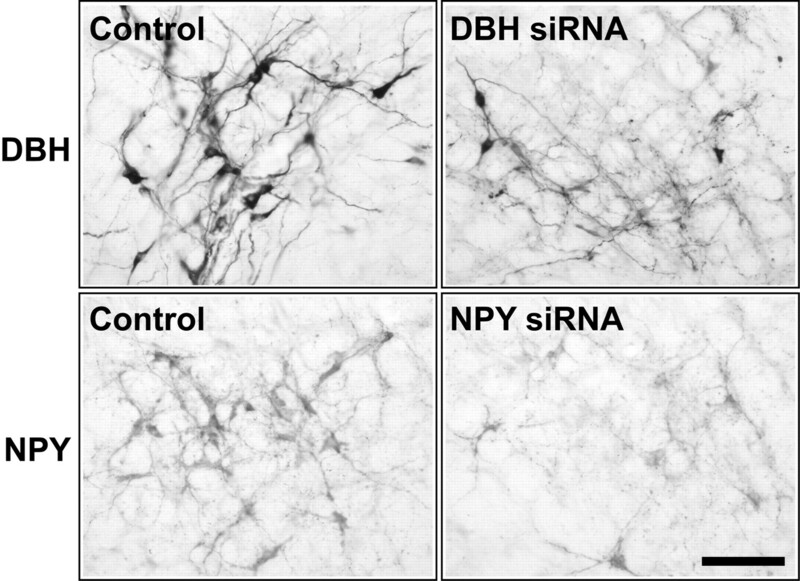 Representative IHC images showing expression of DBH or NPY protein in the A1/C1 region in coronal hindbrain sections from rats injected unilaterally into A1/C1 with DBH siRNA (0.02 nmol), or NPY siRNA (0.02 nmol). Control ntRNA (0.02 nmol) was injected contralaterally into A1/C1. Images show tissue obtained 3 d (for DBH siRNA) or 4 d (for NPY siRNA) after A1/C1 injections. DBH siRNA and NPY siRNA significantly decreased the target gene expression (see quantitative data in Table 2 and 3). Scale bar, 0.1 mm. Based on the preliminary findings discussed above, 2DG-induced feeding and hyperglycemia were tested between 3 and 7 d after bilateral siRNA injection, the time in which gene silencing was demonstrated. Bilateral injections of either NPY siRNA or DBH siRNA (0.02 nmol) into A1/C1 had no effect on 2DG-induced feeding. As shown in Figure 2A, 2DG significantly increased feeding in all groups during the 4-h test, but NPY and DBH siRNA-injected rats did not differ in their intake from ntRNA controls (n = 5–6 rats for each group; Ps >0.6 between groups). 2DG increased blood glucose levels significantly above baseline in all groups at the 90 min sampling time (n = 5 – 6/group) but there were no differences between groups either before (p > 0.8) or 90 min after (p > 0.9) 2DG injection (Fig. 2B). Effect of single siRNA injection on glucoprivic responses and target gene expression. A shows the effect of NPY siRNA, DBH siRNA, or control ntRNA injected bilaterally into A1/C1 (0.02 nmol/side), on 4 h saline- or 2DG (200 mg/kg)-induced feeding. Food intake was increased significantly above saline baseline by 2DG, but there were no significant between-group differences either in the response to 2DG or in baseline feeding. B shows effects of the same treatments on 2DG-induced hyperglycemia. Blood glucose was measured 15 min before (Pre) and 90 min after (Post) 2DG injection. Blood glucose levels were significantly increased above baseline by 2DG, but there were no significant differences between groups. C, Numbers of DBH- and TH-positive cells in A1/C1 as determined by quantification of IHC. Data were obtained from rats used in the above feeding and blood glucose tests. DBH siRNA significantly inhibited DBH expression, but not TH expression, in A1/C1 region. **p < 0.001 (vs control). Immunohistochemical results from these same animals are shown in Figure 2C. Cell counts indicate that injections of DBH siRNA (n = 7) into A1/C1 decreased the number of DBH-positive cells in the A1/C1 area to 58.7% of the number present in anatomically equivalent area in the ntRNA controls (n = 7; p < 0.001, vs the control, Bonferroni t test). Injection of NPY siRNA did not significantly reduce DBH-positive cell numbers, which were 85.4% of the number in ntRNA control rats (n = 6; p > 0.1). 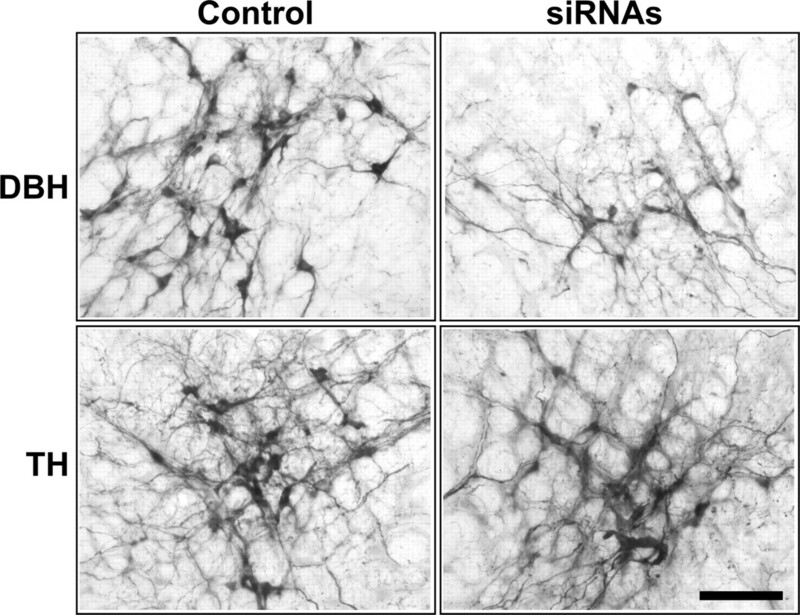 Neither DBH siRNA nor NPY siRNA had effects on the numbers of TH-positive cells in A1/C1 (p > 0.1 between groups), indicating that the injections did not alter Th expression or destroy the targeted neurons. In contrast to separate injections of NPY and DBH siRNAs, which produced no effects of feeding or blood glucose responses to 2DG, simultaneous injection of NPY siRNA and DBH siRNA caused a significant reduction in the feeding response (Fig. 3A). Food intake was increased significantly by 2DG in rats injected with ntRNA (n = 6 rats), whereas the feeding in rats injected with DBH + NPY siRNAs (n = 7) was only 39.2% of the control intake (p < 0.002; vs the control rats by Bonferroni t test after one-way ANOVA). The rats with the same mixture of siRNAs, but injected outside the A1/C1 area (Fig. 3, “Missed” group), did not differ in their intake from the ntRNA controls (n = 6; p > 0.9 between groups). All rats ate similar amounts of food after saline injection (n = 4–7 rats; p > 0.4 between groups). As shown in Figure 3B, blood glucose levels were elevated in all rats after 2DG injection and there were no differences between groups either 15 min before or 90 min after the 2DG injection (n = 3–7 rats; Ps >0.3 among groups). Effect of combined NPY siRNA and DBH siRNA injection on glucoprivic responses and target gene expression. A shows the effect of DBH siRNA (0.02 nmol) + NPY siRNA (0.02 nmol) (mixed siRNAs) or control ntRNA injected bilaterally into A1/C1, and the effect of the mixed siRNAs injected more dorsally to miss the A1/C1 area (Missed siRNAs), on 4 h saline- or 2DG (200 mg/kg)-induced feeding. Combined siRNAs injected into A1/C1 reduced the 2DG feeding response. **p < 0.001 (vs control). B shows the effect of the same treatments on 2DG-induced hyperglycemia. Glucose levels were measured 15 min before (Pre) and 90 min after (Post) 2DG injection. Blood glucose was significantly increased by 2DG in all groups, but no significant between-group differences were observed. C, Numbers of DBH- and TH-positive cells in A1/C1 by IHC, quantified from rats used in the 2DG tests. DBH siRNA/NPY siRNA mixture injected into A1/C1 significantly inhibited DBH expression, but not TH expression in A1/C1 region. **p < 0.001 (vs control). Immunohistochemical analysis of rats used in the feeding and glucose tests, show that the number of DBH-positive cells in the A1/C1 in rats injected with the combined NPY + DBH siRNAs was only 56.5% of the ntRNA control (p < 0.001), as shown in Figure 3C and Figure 4, whereas numbers of TH-positive cells in A1/C1 were not significantly different among those groups (n = 5–10 rats for each group; p > 0.5 among groups), demonstrating that the injections did not lesion cells at the injection site. Representative IHC images showing DBH and TH protein expression in A1/C1 in coronal hindbrain sections. A mixture of DBH siRNA and NPY siRNA (each 0.02 nmol), or control ntRNA was injected bilaterally into A1/C1. Images were obtained from rats used in Figure 3. The mixture of siRNAs significantly decreased DBH expression without reducing TH expression, when compared with controls injected with ntRNA. Scale bar, 0.1 mm. 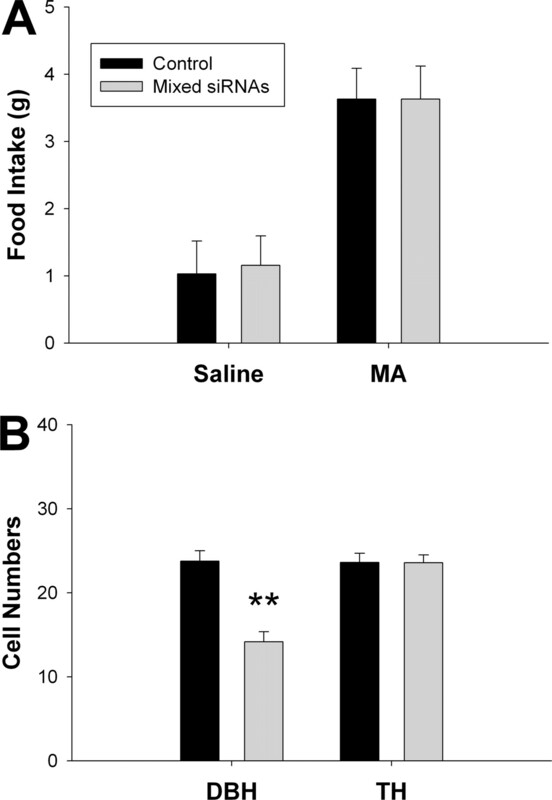 MA significantly increased food intake above saline baseline both in ntRNA-injected rats (n = 7) and in rats injected with DBH + NPY siRNAs (n = 7) (Ps >0.002; vs saline control) (Fig. 5A). There were no significant differences between these two groups either after MA or saline injection (Ps >0.8). Effect of combined NPY and DBH siRNA injection on lipoprivic feeding and target gene expression. A shows the effect of DBH siRNA (0.02 nmol) + NPY siRNA (0.02 nmol) (Mixed siRNAs) or control ntRNA injected bilaterally into A1/C1 on 4 h saline- or MA (68 mg/kg)-induced feeding. MA-induced feeding did not differ between the combined siRNA- and ntRNA-injected rats. B shows numbers of DBH- and TH-immunoreactive cells in A1/C1, quantified from rats used in lipoprivic feeding tests. DBH siRNA/NPY siRNA mixture injected into A1/C1 significantly inhibited DBH expression, but not TH expression in A1/C1 region. **p < 0.001 (vs control). Immunohistochemical analysis showed that the number of DBH-positive cells in A1/C1 in rats injected with the combined NPY + DBH siRNAs was 59.6% of the ntRNA control (p < 0.001) (Fig. 5B), whereas numbers of TH-positive cells in A1/C1 were not significantly different between groups (p > 0.9). In the present study, we injected naked siRNAs, without transfection reagents or viral vectors, into A1/C1 cell group to target Npy and Dbh. We found that both NPY siRNA and DBH siRNA produced effective, selective and reversible silencing of the targeted genes that was limited to the injection site. Specificity of siRNAs in reducing target gene expression was demonstrated by results showing that immunoreactivity for TH, which is present in all A1/C1 neurons, was not reduced by either single or combined injection of NPY or DBH siRNAs. Silencing of gene expression was localized to the A1/C1 injection site. Targeted genes in immediately adjacent A1 and C1m were not suppressed, as indicated by the normal expression of their protein products. Gene silencing by NPY siRNA or DBH siRNA was reversible. NPY mRNA levels recovered after 3 d, whereas inhibition of NPY and DBH protein expression persisted >1 week. These observations are consistent with other published studies showing reversible silencing of gene expression after single injections of naked siRNA into the brain (Makimura et al., 2002; Akaneya et al., 2005; Chen et al., 2006). We found that localized silencing of Npy and Dbh expression in A1/C1 significantly reduced the feeding response to systemic 2DG-induced glucoprivation. Only injection of the combined siRNAs was effective. Separate silencing of either the Npy or Dbh alone did not reduce the feeding response. Furthermore, MA-induced feeding was normal in the combined siRNA-injected rats, suggesting that the response to glucoprivation was not reduced by a nonspecific behavioral impairment. These results indicate that catecholamines and NPY, which are coexpressed in A1/C1 neurons, act conjointly in controlling glucoprivic feeding. The hyperglycemic response to 2DG was not impaired, indicating that A1/C1 neurons are not required for this response, as indicated by other data (Ritter et al., 2001). The results of this study add to the increasing evidence that feeding triggered by glucose deficit requires DBH/NPY coexpressing neurons. Studies using mice with deletions of Dbh and Npy have shown that deletion of either gene impairs, but does not abolish, the feeding response (Ste Marie and Palmiter, 2003). Hindbrain, but not arcuate, NPY neurons appear to be those required for glucoprivic feeding. Lesion of NPY/agouti-related peptide (AGRP) neurons in the arcuate nucleus using NPY-saporin (Bugarith et al., 2005) or deletion of these neurons in mice by genetic insertion of the human diphtheria toxin receptor (heparin-binding epidermal growth factor) targeted to Agrp locus (Luquet et al., 2007) does not impair glucoprivic feeding, whereas lesion of hindbrain catecholamine/NPY neurons using PVH injections of the selective retrogradely transported immunotoxin, anti-DBH-saporin, abolishes the feeding response (Ritter et al., 2001). Moreover, hindbrain catecholamine innervation of the medial hypothalamus is required for glucoprivation-induced increases in hypothalamic NPY and AGRP mRNA expression (Fraley and Ritter, 2003). Identification of NPY as a critical comediator of glucoprivic feeding facilitates localization of the particular neurons involved, and was central to the hypothesis tested in this experiment, because a large percentage of neurons of this phenotype are located in A1/C1 (Sawchenko et al., 1985). The effects we have observed with gene silencing now provide definitive evidence that NPY and catecholamines in A1/C1 neurons are required for glucoprivic feeding and that corelease of both is essential for the normal function of these neurons. It has long been know that both catecholamines and NPY are potent orexigens when injected singly into the brain (Ritter et al., 1975; Stanley and Leibowitz, 1984; 1985; Leibowitz et al., 1988; Taylor et al., 2007) and that acute pharmacological blockade of catecholamine neurotransmission (Müller et al., 1972) or injection of anti-NPY antibody into the PVH (He et al., 1998) impairs glucoprivic feeding. Similarly, the coexpression of NPY in hindbrain Epi and NE neurons that innervate the hypothalamus has been known for many years (Sawchenko et al., 1985). However, the question of how these coreleased substances interact to influence feeding has not been addressed. At vascular neuroeffector junctions peripheral sympathetic terminals costore NPY and NE in the large dense-core vesicles and corelease them on electrical stimulation (Fried et al., 1985; De Potter et al., 1988, 1997). Corelease induces vasoconstriction. When NPY and NE are administrated together in human vascular biopsies, NPY dramatically potentiates the NE-evoked vessel constriction through an NPY receptor-dependent mechanism (Donoso et al., 2004a,b; Huidobro-Toro and Donoso, 2004). In the supraoptic nucleus, substance P and NPY, coreleased by some catecholamine terminals in that site, differentially potentiate Epi-induced vasopressin and oxytocin secretion (Kapoor and Sladek, 2001). Additional work will be required to determine the mechanism and nature of the interaction between coreleased NPY and catecholamines at central terminals controlling food intake. The fact that 2DG, but not MA-induced feeding, was impaired by Npy and Dbh gene silencing is consistent with several lines of research indicating that 2DG and MA stimulate feeding by distinct metabolic signal processing and by the effects of those signals on distinct neural pathways. Elimination of capsaicin-sensitive vagal sensory neurons (Ritter and Taylor, 1989) or surgical subdiaphragmatic vagotomy (Ritter and Taylor, 1990) abolishes MA-, but not 2DG-, induced feeding. Anti-DBH-saporin lesion of hindbrain catecholamine neuron subpopulations abolishes 2DG-, but not MA-, induced feeding (Ritter et al., 2001). Furthermore, administration of low suprathreshold doses of 2DG and MA are almost precisely additive, and capsaicin treatment blocks only the MA component of the additive response (Ritter and Taylor, 1989). Electrolytic lesions in the lateral parabrachial nucleus or central nucleus of the amygdala abolish MA-, but not 2DG-, induced feeding (Calingasan and Ritter, 1993; Ritter and Hutton, 1995). Finally, MA and 2DG elicit different patterns of gene expression in hypothalamic feeding-regulatory sites (Sergeyev et al., 2000). Thus, the present results emphasize the specific importance of A1/C1 neurons for the glucoprivic feeding response, and in addition, highlight an organizational strategy within the brain for independent processing of distinct metabolic signals. The level of Dbh and Npy gene silencing achieved in our study was ∼50%, as indicated by real-time PCR and IHC, respectively. We found that increasing the amount of injected siRNA did not significantly increase gene silencing. Similar levels of mRNA depletion have been reported in previous studies using either single injection or continuous infusion of siRNA into the brain (Makimura et al., 2002; Thakkar et al., 2003; Thakker et al., 2004; Chen et al., 2006). This incomplete gene silencing may be the result of degradation of siRNA at the injection site and/or limited penetration of siRNA into cells. Alternatively, the diffusion radius of our 200 nl siRNA injection may have been inadequate to silence the gene throughout A1/C1. The amount of gene silencing achieved by our approach was clearly adequate to suppress the glucoprivic feeding response to only 37% of control. Nevertheless, the feeding response was not completely blocked and this may be a result that should not be overlooked. Of course, incomplete response suppression may be attributable to incomplete silencing of Npy and Dbh expression. However, two additional and potentially important factors may also be accountable. First, there may be NPY/catecholamine neurons in other cell groups that contribute to the feeding response and that continue to function normally during gene silencing of the A1/C1 population. Cells in C1m, C2 and C3 would be likely contributors. These groups include cell bodies that coexpress NPY, are activated by glucoprivation, and that project to the hypothalamus. Second, there may be an additional coexpressed substance in the A1/C1 neurons capable of mediating a limited response, even when NPY and catecholamine production in these same cells is suppressed. For example, glutamate (Stornetta et al., 2002), ATP (Kennedy et al., 1996) and cocaine- and amphetamine-related transcript (Dun et al., 2002) are coexpressed in certain catecholamine neurons, supporting the possibility that additional comediators may be present in the A1/C1 catecholamine neurons involved in glucoprivic feeding. Injection of anti-DBH-saporin into the ventral hindbrain, causing extensive (>80%) loss of catecholamine neurons throughout the rostral VLM, attenuates the hyperglycemic response to systemic glucoprivation (Madden et al., 2006). However, silencing of Npy and Dbh expression in A1/C1 did not impair the 2DG-induced hyperglycemic response. It is likely that this result is attributable to the narrow targeting of our injections to the A1/C1 region. Spinally projecting catecholamine neurons mediate this response and the A1/C1 cell group does not contain spinally projecting neurons (Sawchenko et al., 1985; Ritter et al., 2001). Although such neurons are present in C1m and C1r, neither Npy and Dbh or their protein products were suppressed in contiguous A1 and C1m regions with our injection parameters. Therefore, A1/C1 neurons can be ruled out as being essential for direct control of blood glucose, but a role for spinally projecting NPY/catecholamine coexpressing neurons in other sites, such as C1m, C2 or C3, cannot yet be ruled out (Minson et al., 1994; Stornetta et al., 1999). Alternatively, NPY may not be involved in this response. Rather, other neuroactive substances may comediate the adrenal medullary response to glucoprivation. Glutamate is a particularly interesting candidate for this role because nearly all bulbospinal Epi neurons coexpress glutamate, and glutamate activates presympathetic neurons more robustly than Epi (Morrison, 2003). This work was supported by Public Health Service Grants DK 40498 and NS 4552004 to S.R. (2005) RNAi-induced gene silencing by local electroporation in targeting brain region. J Neurophysiol 93:594–602. (1981) 2-Mercaptoacetate administration depresses the beta-oxidation pathway through an inhibition of long-chain acyl-CoA dehydrogenase activity. Biochem J 196:803–809. (1983) Inhibition in vitro of acyl-CoA dehydrogenases by 2-mercaptoacetate in rat liver mitochondria. Biochem J 215:457–464. (2005) Basomedial hypothalamic injections of neuropeptide Y conjugated to saporin selectively disrupt hypothalamic controls of food intake. Endocrinology 146:1179–1191. (1993) Lateral parabrachial subnucleus lesions abolish feeding induced by mercaptoacetate but not by 2-deoxy-D-glucose. Am J Physiol 265:R1168–R1178. (2006) REM sleep changes in rats induced by siRNA-mediated orexin knockdown. Eur J Neurosci 24:2039–2048. (2006) Peripheral ghrelin transmits orexigenic signals through the noradrenergic pathway from the hindbrain to the hypothalamus. Cell Metab 4:323–331. (1988) Evidence for the co-storage and co-release of neuropeptide Y and noradrenaline from large dense cored vesicles in sympathetic nerves of the bovine vas deferens. Synapse 2:157–162. (1997) Noradrenergic neurons release both noradrenaline and neuropeptide Y from a single pool: the large dense cored vesicles. Synapse 25:44–55. (2005) RNAi as an experimental and therapeutic tool to study and regulate physiological and disease processes. Annu Rev Physiol 67:147–173. (2006) Hypotensive hypovolemia and hypoglycemia activate different hindbrain catecholamine neurons with projections to the hypothalamus. Am J Physiol Regul Integr Comp Physiol 291:R870–R879. (2004a) Release and functional role of neuropeptide Y as a sympathetic modulator in human saphenous vein biopsies. Peptides 25:53–64. (2004b) Neuropeptide Y is released from human mammary and radial vascular biopsies and is a functional modulator of sympathetic cotransmission. J Vasc Res 41:387–399. (2002) Cocaine- and amphetamine-regulated transcript peptide-immunoreactivity in adrenergic C1 neurons projecting to the intermediolateral cell column of the rat. J Chem Neuroanat 23:123–132. (1984) Differential co-existence of neuropeptide Y (NPY)-like immunoreactivity with catecholamines in the central nervous system of the rat. Neuroscience 11:443–462. (2003) Immunolesion of norepinephrine and epinephrine afferents to medial hypothalamus alters basal and 2-deoxy-D-glucose-induced neuropeptide Y and agouti gene-related protein messenger ribonucleic acid expression in the arcuate nucleus. Endocrinology 144:75–83. (1985) Evidence for differential localization of noradrenaline and neuropeptide Y in neuronal storage vesicles isolated from rat vas deferens. J Neurosci 5:450–458. (1994) Inhibition of the A1 area prevents hemorrhage-induced secretion of vasopressin in rats. Brain Res 657:330–332. (1998) Neuropeptide Y antibody attenuates 2-deoxy-D-glucose induced feeding in rats. Brain Res 781:348–350. (2004) Sympathetic co-transmission: the coordinated action of ATP and noradrenaline and their modulation by neuropeptide Y in human vascular neuroeffector junctions. Eur J Pharmacol 500:27–35. (2003) Immunotoxic destruction of distinct catecholaminergic neuron populations disrupts the reproductive response to glucoprivation in female rats. Endocrinology 144:4325–4331. (2001) Substance P and NPY differentially potentiate ATP and adrenergic stimulated vasopressin and oxytocin release. Am J Physiol Regul Integr Comp Physiol 280:R69–R78. (1996) ATP as a co-transmitter with noradrenaline in sympathetic nerves–function and fate. Ciba Found Symp 198:223–235. (1988) Neuropeptide Y, epinephrine and norepinephrine in the paraventricular nucleus: stimulation of feeding and the release of corticosterone, vasopressin and glucose. Brain Res Bull 21:905–912. (2004) Glucoprivation increases expression of neuropeptide Y mRNA in hindbrain neurons that innervate the hypothalamus. Eur J Neurosci 19:2147–2154. (2006) Differential responsiveness of dopamine-beta-hydroxylase gene expression to glucoprivation in different catecholamine cell groups. Endocrinology 147:3428–3434. (2007) NPY/AgRP neurons are not essential for feeding responses to glucoprivation. Peptides 28:214–225. (2003) Cardiovascular regulation after destruction of the C1 cell group of the rostral ventrolateral medulla in rats. Am J Physiol Heart Circ Physiol 285:H2734–H2748. (2006) Attenuation of homeostatic responses to hypotension and glucoprivation after destruction of catecholaminergic rostral ventrolateral medulla neurons. Am J Physiol Regul Integr Comp Physiol 291:R751–R759. (2002) Reducing hypothalamic AGRP by RNA interference increases metabolic rate and decreases body weight without influencing food intake. BMC Neurosci 3:18. (1994) Bulbospinal neuropeptide Y-immunoreactive neurons in the rat: comparison with adrenaline-synthesising neurons. J Auton Nerv Syst 47:233–243. (2003) Glutamate transmission in the rostral ventrolateral medullary sympathetic premotor pathway. Cell Mol Neurobiol 23:761–772. (1972) Brain adrenergic system in the feeding response induced by 2-deoxy-D-glucose. Am J Physiol 223:945–950. (1997) The rat brain in stereotaxic coordinates (Academic, San Diego), 3rd ed. (2006) Noradrenergic pain modulation. Prog Neurobiol 80:53–83. (2003) Hindbrain noradrenergic lesions attenuate anorexia and alter central cFos expression in rats after gastric viscerosensory stimulation. J Neurosci 23:10084–10092. (1995) Mercaptoacetate-induced feeding is impaired by central nucleus of the amygdale lesions. Physiol Behav 58:1215–1220. (1989) Capsaicin abolishes lipoprivic but not glucoprivic feeding in rats. Am J Physiol 256:R1232–R1239. (1990) Vagal sensory neurons are required for lipoprivic but not glucoprivic feeding in rats. Am J Physiol 258:R1395–R1401. (1975) Neurochemical regulation of feeding in the rat: facilitation by alpha-noradrenergic, but not dopaminergic, receptor stimulants. J Comp Physiol Psychol 88:778–784. (1998) Subgroups of hindbrain catecholamine neurons are selectively activated by 2-deoxy-D-glucose induced metabolic challenge. Brain Res 805:41–54. (2001) Immunotoxic destruction of distinct catecholamine subgroups produces selective impairment of glucoregulatory responses and neuronal activation. J Comp Neurol 432:197–216. (2003) Immunotoxin lesion of hypothalamically projecting norepinephrine and epinephrine neurons differentially affects circadian and stressor-stimulated corticosterone secretion. Endocrinology 144:1357–1367. (1985) Colocalization of neuropeptide Y immunoreactivity in brainstem catecholaminergic neurons that project to the paraventricular nucleus of the hypothalamus. J Comp Neurol 241:138–153. (1986) Control of food intake by fatty acid oxidation. Am J Physiol 250:R1003–R1006. (2000) Effect of 2-mercaptoacetate and 2-deoxy-D-glucose administration on the expression of NPY, AGRP, POMC, MCH and hypocretin/orexin in the rat hypothalamus. Neuroreport 11:117–121. (2004) Therapeutic siRNAs. Trends Pharmacol Sci 25:22–28. (1984) Neuropeptide Y: stimulation of feeding and drinking by injection into the paraventricular nucleus. Life Sci 35:2635–2642. (1985) Neuropeptide Y injected in the paraventricular hypothalamus: a powerful stimulant of feeding behavior. Proc Natl Acad Sci U S A 82:3940–3943. (2003) Norepinephrine and epinephrine-deficient mice are hyperinsulinemic and have lower blood glucose. Endocrinology 144:4427–4432. (1999) Location and electrophysiological characterization of rostral medullary adrenergic neurons that contain neuropeptide Y mRNA in rat medulla. J Comp Neurol 415:482–500. (2002) Vesicular glutamate transporter DNPI/VGLUT2 is expressed by both C1 adrenergic and nonaminergic presympathetic vasomotor neurons of the rat medulla. J Comp Neurol 444:207–220. (2007) Hypothalamic and hindbrain NPY, AGRP and NE increase consummatory feeding responses. Physiol Behav 90:744–750. (2003) A1 receptor and adenosinergic homeostatic regulation of sleep-wakefulness: effects of antisense to the A1 receptor in the cholinergic basal forebrain. J Neurosci 23:4278–4287. (2004) Neurochemical and behavioral consequences of widespread gene knockdown in the adult mouse brain by using nonviral RNA interference. Proc Natl Acad Sci U S A 101:17270–17275.